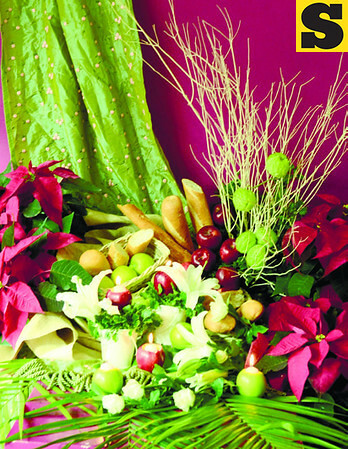 The cornucopia, or the symbol of abundance, is what designer Joseph Ursal of Fleur de Liz flower shop calls this arrangement, set up not at the usual center, but rather at the end of the table. A show-stopper, it puts the season’s flowers, poinsettias, in abundant display. Although here you can freely set up whatever food stuff you want, Joseph chose French bread and apples (arranged in wicker baskets) for this purpose. For accents, he uses twigs called shapu. Well, you can always use the apples as your candle holders!